Hate incidents can happen anywhere: the mall, the church, the office. But, in the wake of the 2016 election, hate’s been showing up a lot in school. According to the Southern Poverty Law Center, in the months following the election more hate incidents took place in America’s schools than anywhere else. Hundreds of elementary, middle and high schools have played host to an array of troubling events, from sophomoric stunts to much worse: a hijab pulled off a Muslim student, physical fights with racial epithets flung, even violent threats. 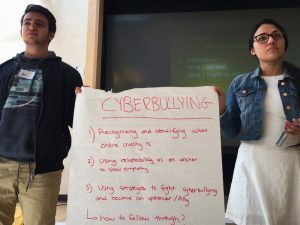 In Medway, a video began circulating showing a student with a rifle, saying the N-word and “kill ’em all.” This was just one of dozens of school incidents called in to a hate hotline set up by the Massachusetts attorney general. As Attorney General Maura Healey puts it, when it comes to student behavior, “there’s right and there’s wrong.” But it is not always as clear what crosses the line, legally. A high school in Attleboro called for help after finding pro-Trump graffiti in the boys’ bathroom. It included a warning about how the KKK would “handle” African Americans — again using the N-word. Indeed, many schools are figuring it out as they go. They are grappling with how to prevent and respond to incidents, often under enormous pressure and amid public outcry. Some have come under fire — and investigation — for failing to report incidents. Administrators say they have to strike a delicate balance between being transparent and not giving offenders undue attention or provoking copycats. 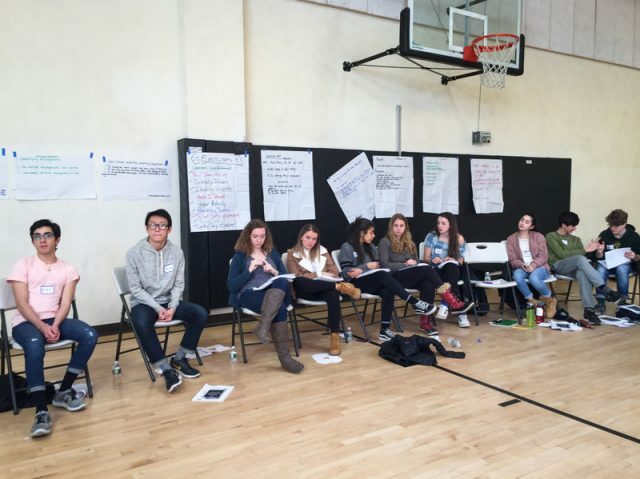 One of the gold standards in teaching tolerance is a program run by the Anti-Defamation League called “A World Of Difference.” The number of schools calling and asking for the program has jumped five-fold recently. Brookline High School reached out after being hit with two incidents of racist and anti-Semitic graffiti. Administrators recruited 30 students to go through three full days of training — to learn to run tolerance workshops for their peers. “Ok, folks! Showtime!” bellows the ADL’s New England Senior Training Consultant Rob Jones from the front of a gymnasium. 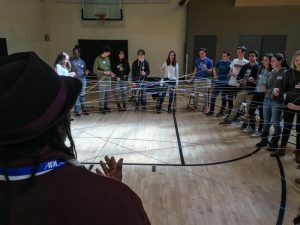 His dreadlocks swinging out from under a felt fedora, Jones bounces around the circle of students, grilling them on what they’ve learned from the exercises they have done so far and getting them ready to be leaders instead of participants. 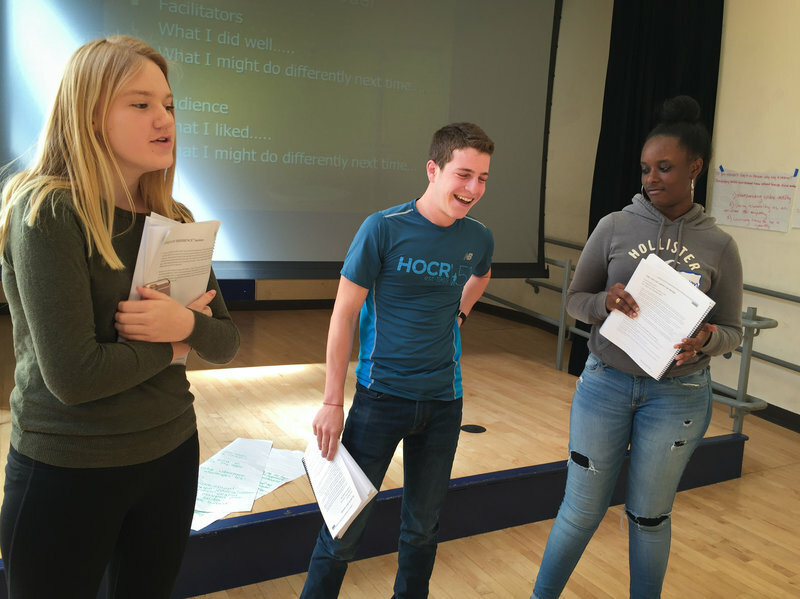 They begin by practicing how they will introduce themselves to classmates when they run a workshop. Indeed, even in their left-leaning “bubble” — as some Brookline students call it — they have seen an uptick in hate. Junior Talia Vos, who moved to Brookline from Mexico, says she felt it the day after the election. She was in the hallway between classes and yelled out to a friend — in Spanish — to save her a seat. Following the KKK graffiti in Attleboro, dozens of students mobilized to counter the hate with kindness. They wrote “love notes” to each of the high school’s nearly 2,000 students, staffers and teachers.